NETWORK UPDATE: The season finale of ONCE UPON A TIME, BROOKLYN NINE-NINE and the primetime overrun of PGA GOLF gained 0.1 in final numbers, while DATELINE lost 0.1. CABLE HIGHLIGHTS: GAME OF THRONES (HBO) once again wore the Sunday crown, down 0.08 to 3.48. Elsewhere on HBO, SILICON VALLEY dropped 0.11 to 0.92, LAST WEEK TONIGHT fell 0.12 to 0.59 and VEEP lost 0.07 to 0.43. On Showtime, PENNY DREADFUL was down a tick to 0.21, NURSE JACKIE shed 0.05 to 0.20, and HAPPYISH (which didn’t even make the supplemental chart) took a hit, down 0.06 to 0.04, with 208K total viewers. The penultimate MAD MEN (AMC) was down a hundredth to 0.64. On E!, KEEPING UP WITH THE KARDASHIANS was up 0.08 to 1.05, and THE ROYALS upticked to 0.56. Bravo’s REAL HOUSEWIVES OF ATLANTA dropped 0.12 to 1.14, and BLOOD, SWEAT AND HEELS fell 0.08 to 0.46, with FASHION QUEENS down 0.09 to 0.21. 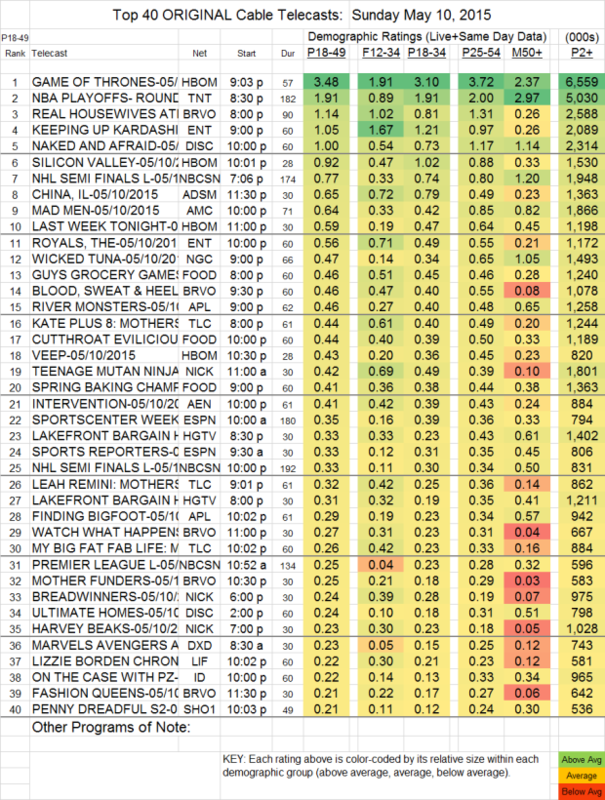 On Discovery, NAKED AND AFRAID was off by 0.11 to 1.00. In the sports realm, TNT’s NBA PLAYOFFS game was at 1.91, and NBC Sports Net’s NHL PLAYOFFS games was at 0.77/0.33. CHINA, IL (Adult Swim) lost a tenth to 0.55. A TLC KATE PLUS 8 Mother’s Day special was at 0.44, and a LEAH REMINI Mother’s Day special was at 0.32. A&E’s INTERVENTION was at 0.41. LIZZIE BORDEN CHRONICLES dropped 0.08 to 0.22. SALEM (WGNAmerica) rose 0.03 to 0.13.